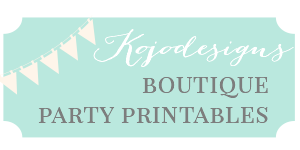 Awhile back, I saw some fabulous gold fridge-magnet-esque letters on Pinterest (turns out, they are jewelry, but still). 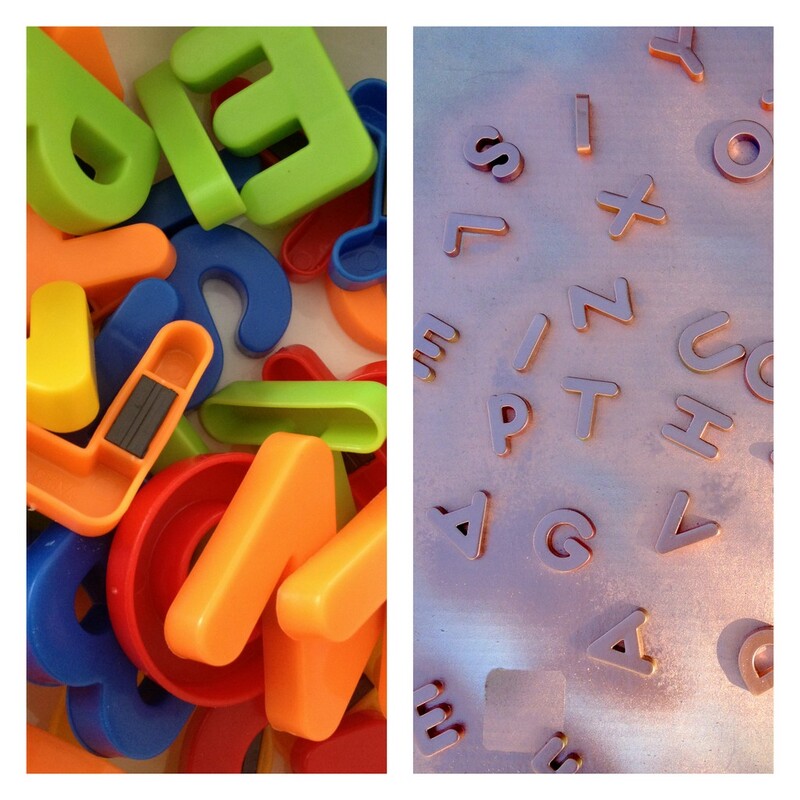 That same afternoon, I ordered a package of alphabet magnets. 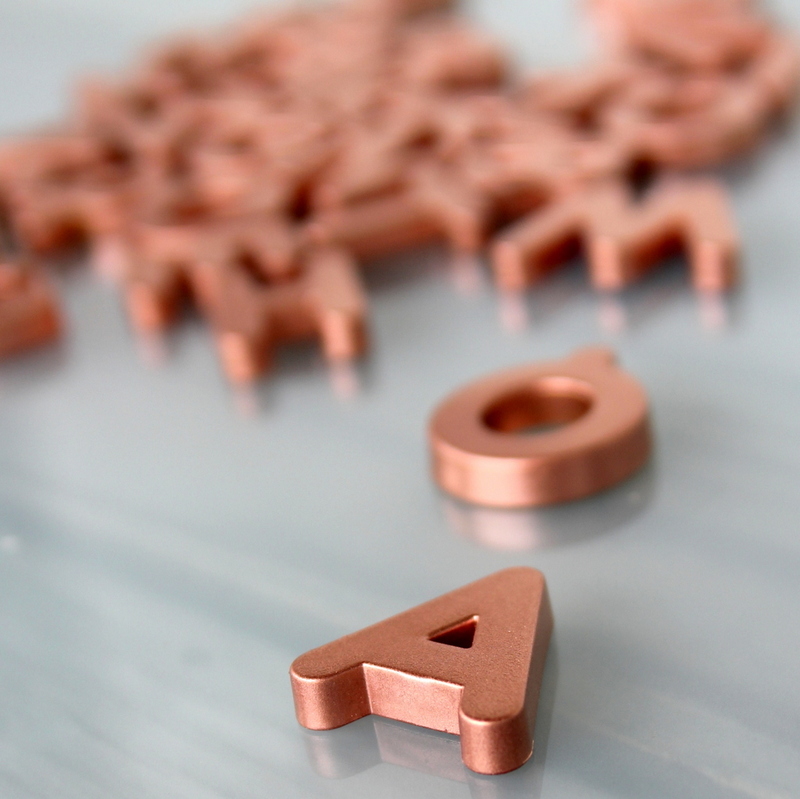 After making them copper with metallic spray paint, I am absolutely smitten. In fact, I smile each time I walk past my fridge and see them in their shiny magnet jumbles. 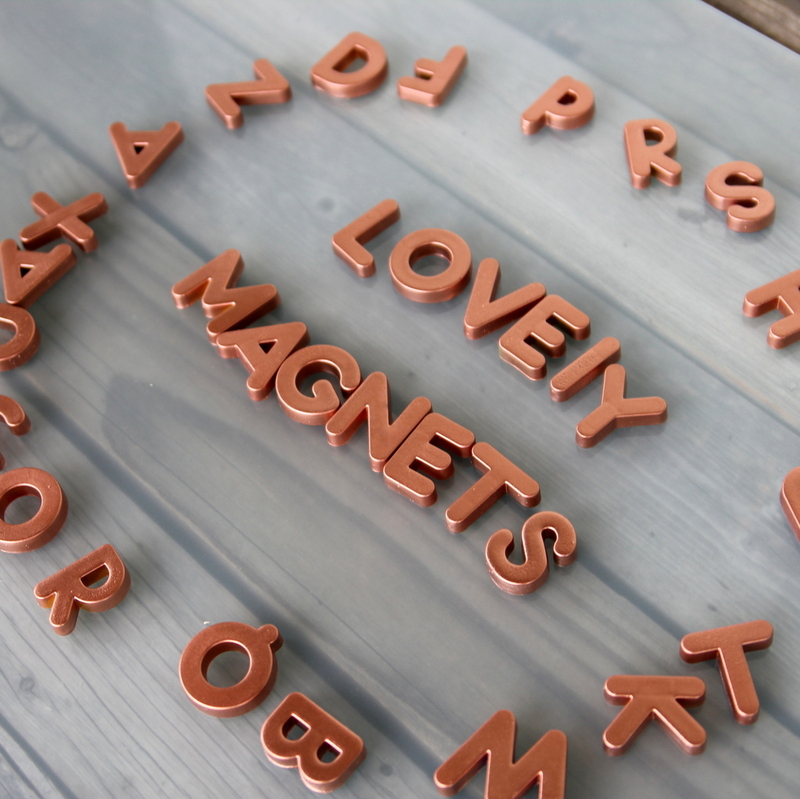 I just ordered some more alphabet magnets to turn into metallic Christmas presents (plus, I want to make a set of gold alphabet magnets for myself) and thought I’d pass along the gift idea. Even better- these are so very easy to make. 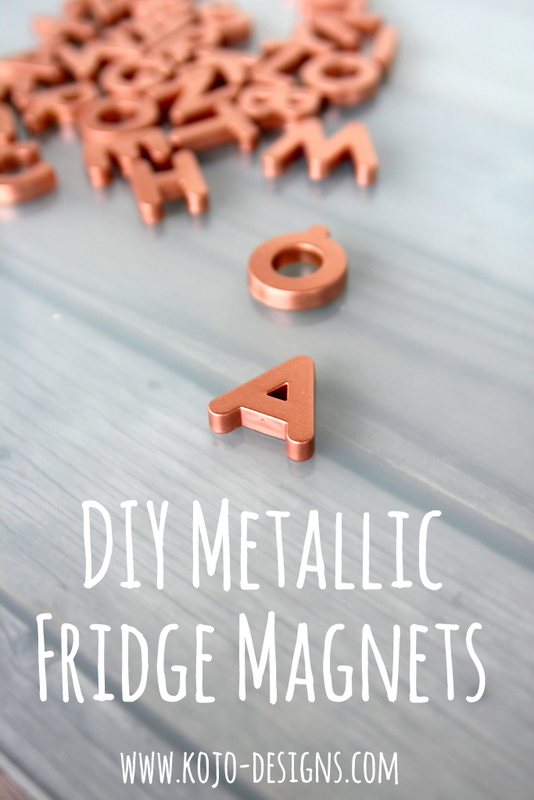 Just lay out your alphabet magnets, spray lightly with metallic spray paint and repeat every 10 minutes or so from varying angles until all of the crevices and letter cut-outs are covered (remember, light coats are key). Let dry for at least 24 hours and your metallic alphabet is done! These are gorgeous! Great idea! About how many coats do you think it took you to get complete coverage? What brand/type of paint did you use? I did this a few months back and had to pull them all off after a certain munchkin kept pulling them off and shoving them in her mouth. Which wouldn’t be a big deal but I saw lots of damage on them aka flaking spray paint. Someone had mentioned that might be a problem when I posted it on instagram but I thought we were past the mouth shoving phase. Alas ours are gone until our kids can be as good as Piper and Burke ha! I love these so much Kirstin!!! Awesome. These look fantastic! Thanks so much for sharing. 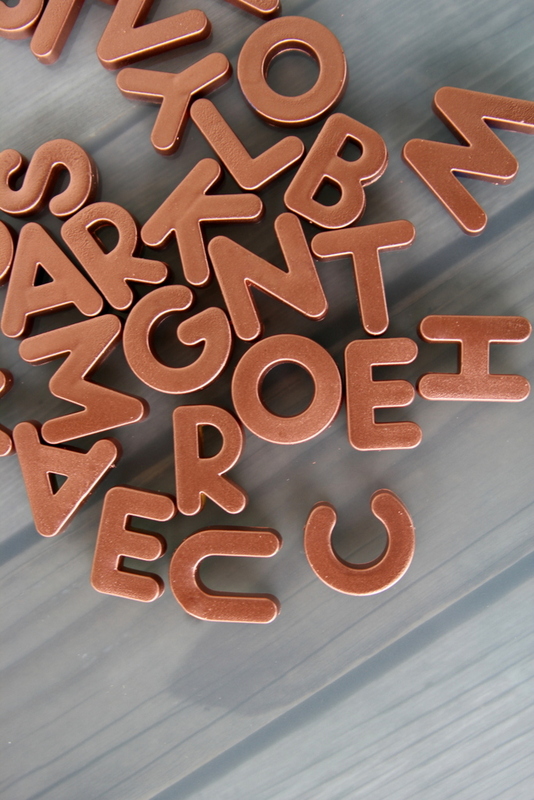 Fabulous idea, but what surface would you lay the alphabets on to spray paint without worries of them sticking to the surface when drying? Hey Janice- I laid them on cardboard and sprayed them and had no troubles with them sticking. Hope that helps! Anyone know of any baby/toddler-safe paints that would work with this project? Hmmm, I don’t know of any. But if you find any, let me know!